GM inline filter part #15-1760/52474434-----bought this filter on ebay. is this just a filter or does it have an orifice tube in it? the orientation arrow sticker has come off, how is it installed on the line? does the screen point to the gas flow? two o rings, two end nuts and two compression washers. how are they installed? lastly, what is the feeling amonst the pros on installing in line filters? thanks. hi, gm tech. need your input. hi. well, I tried to install the filter on the liquid line. disaster, ruined the line. anyone know where I can get a liquid line. woe is me. I buy 3/8 inch aluminum tubing from Grainger 6 ft long tubes and then bend and form my own- and use swageloks to piece together, whenever I can't find the tube at a parts house. do you need special equipment to do this? this is probably a stupid question. 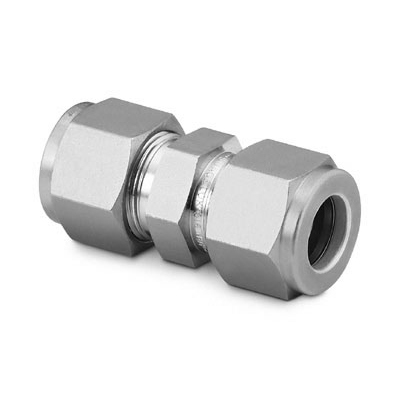 what size swageloks and fitting type do I need for 3/8" tubing? thanks I just might try making the hi side line. thanks. gm tech, can you put up a picture of the fitting? it has to have a female screw on to male. better yet. a part number. Not sure why you are concerned about screw-on to male--- just cut the line at a point where it runs straight and use the unions below. I was thinking of making a whole new line, not using the old one. so I would need to connect the condenser output and the orifice tube input. both of these have male threads on them. thanks for the info. Those lines are also english male threads- they converted to metric threads in '94 MY. Good luck getting the connections apart- another reason to splice- Those old lines are subject to galvanic corrosion- and can pull the threads right off your condenser or the OT connection. yes, that's a very valid point. I think splice is the way to go. btw I couldn't find aluminum swageloks on ebay, only stainless? Stainless body with aluminum ferrules would be OK, but I doubt that is a standard product. Do not use stainless ferrules on aluminum, the ferrules must be the same or softer metal than the tube for a reliable seal. can you buy just the ferrules? if so, where. Yes the ferrules are sold separately though you may need to buy 10 sets at a time (about $1.50 per set). Swagelok has a network of official distributors if you can't find it on fly-by-night sources. thanks for the info. i'am going to do a google search for them.